First off, I’ll offer some definition service for anyone not well versed in fruity colors: Citron is a type of citrus tree, which describes part of the greenish yellow color in the new Vapor IVs and the Vapor SL’s. And yes, they all have charcoal, which creates smoke when lit, which is what you’ll be doing to your opponents when you light the soccer pitch on fire in these amazing new boots - which you'll be hard-pressed to find anywhere esle! The Mercurial Vapor IV FG Cleats by Nike (Citron/Classic Charcoal/Metallic Silver). 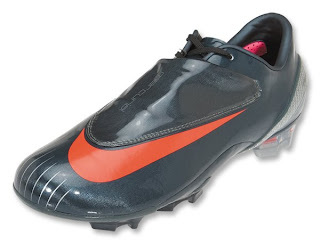 Also the Mercurial Vapor IV FG Cleats (Classic Charcoal/Max Orange/Metallic Silver)). Weighing a mere 9 ounces, with a soft, supple Teijin synthetic leather upper that adjusts to the shape of your foot, contoured speed last, covered lacing for increased strike zone, internal chassis for instant acceleration, and molded sock-liner with EVA inserts for comfort … plus the direct-injected heel studs for weight reduction, Vapor forefoot plate with multi-direction traction studs for optimum performance on firm, natural surfaces - You can't go wrong with these smokin' new boots from Nike! 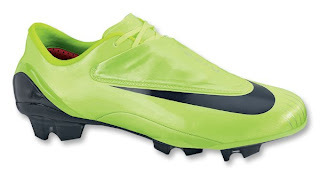 Mercurial Vapor Super Light FG Cleats by Nike (Citron/Classic Charcoal/Metallic Silver). Nike's newest creation is crafted almost entirely of carbon fiber, the revolutionary material used in jets that offers unbelievable strength with incredible lightness. It took Nike three years to design and produce this incredible version of the Vapor. The outsole plate is seven layers of carbon composite material interwoven with TPU and polyurethane. This eliminates the lasting board and puts the foot closer to the ground for a smooth feel. A reinforcing rib offers support. The cleats and stud tips are injected/molded to the plate for a strong, single outsole piece, which creates incredible durability. An internal heel cradle keeps your foot securely in place. This is the first boot to have a molded carbon fiber upper for incredible performance and feel. The result is a boot that weighs less than 7 ounces!